In South Africa, A Reggae Legacy Lives On Lucky Dube, the best-selling South African reggae singer of all time, was murdered during a carjacking in 2007. 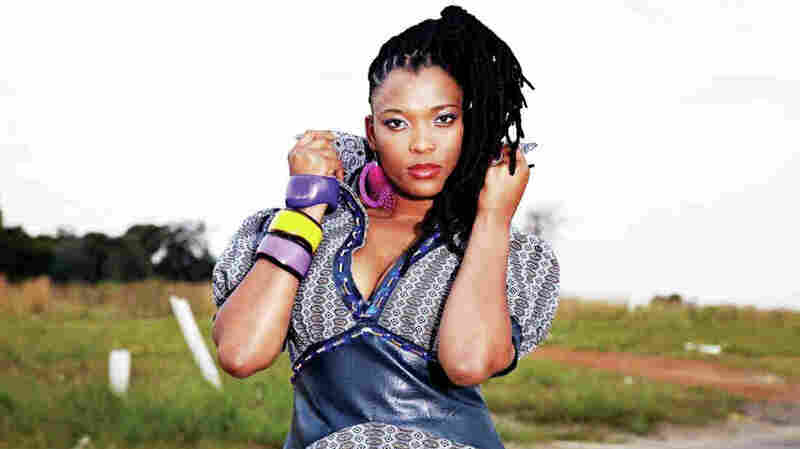 Now his 27-year-old daughter, Nkulee Dube, is African reggae's newest hope. Nkulee Dube's debut album is titled My Way. It's Thursday night in downtown Johannesburg and some 500 people are packed into Bassline, a warehouse-like club in a hipster-friendly neighborhood. They're here for South Africa's longest-running sound system, or crew of reggae DJs. But tonight they get something extra: a young woman sporting dreadlocks and an army cap gets on the mic to freestyle. Her name is Nkulee Dube, and she carries two storied legacies on her shoulders. She's now the country's biggest reggae star — and the daughter of the man sometimes dubbed "Africa's Peter Tosh." "When I travel around the world, people are like, 'We are just happy there is someone taking over, putting on your dad's shoes,' " Dube says. "I'm like, 'What? I cannot put on those shoes. They're very heavy!' "
Reggae, after all, runs deep in South Africa. During the 1970s, songs by Peter Tosh and Burning Spear were gospel to the anti-apartheid movement. James Mange, a reggae artist and former resistance leader, was the first Rastafarian prisoner on Robben Island alongside such anti-apartheid activists as Walter Sisulu and Nelson Mandela. He says they were huge reggae fans. "Walter Sisulu even asked for certain albums in particular: 'That one, that one, by that boy. What is his name?' We'd say, 'Bob Marley; he has about three,' " Mange recalls. "[Sisulu would say] 'Exodus—give me that one.' "
Mange became known as the Bob Marley of Robben Island, where reggae was a mainstay even when warders censored political songs. "It was not anything for entertainment. It was almost like your prayer time, if you like," Mange says. "It was a time when we started remembering why we were where we were and what lay ahead. And it was the kind of food we needed to sustain us during the hard times." During the '80s, South African acts like O'Yaba and Johnny Klegg recorded political reggae tunes and Lucky Dube would become the first African reggae artist to perform in Jamaica. Lucky Dube released 22 albums in three languages. Meanwhile, his daughter, Nkulee, has toured four continents and released her debut album, My Way, in 2011. "When they heard that I was going to release an album, everyone was like, 'You're gonna do reggae like your dad,' " she says. "Obviously I am gonna keep my dad's roots and my dad's teachings. I am part of that reggae history. So that album is just saying, 'Yes, I am. But I am doing it my way and I can do whatever I want, so don't put me in the same box as my dad.'" Nkulee Dube's career started at age 16 — in dance. She toured as a backup dancer with the risqué Afropop star Lebo Mathosa, a woman who made it in the male-dominated South African industry. Mathosa heard Dube singing and invited her onstage one night. Afterward, she took the teenager under her wing. "She created who Nkulee Dube is onstage," Dube says. "Because I would look at her on stage and she would say, 'Do you see what I did there? I moved from that corner to that corner because there's people all around the stage, so you have to perform for each and every person.' "
That was more than Dube got from her father at first. She did not grow up with him, though her mother told her who he was. She waited until she was 18 years old to knock on his studio door. "And he's like, 'Who are you?' I was like, 'Nkulee,' " she says. "He said, 'No, who are you?' I said, 'Nkulee, why?' And he said, 'What are you doing here? Sit down.' I was like, 'I'm your daughter.' And he said, 'I knew it!' "
Their relationship took off from there — in and out of the studio. They recorded still-unreleased duets, and Nkulee got schooled in writing music. "He would say, 'Whenever you write, have depth,' " she says. " 'Let's say it's a love song. Don't just say hey, I love you. Go deeper than that.' "
And in that depth, a legacy lives on.